As part of the refurbishments at the Fitzroy campus of Australian Catholic University (ACU), InSight Systems were engaged to install a new audio visual system in the library. The scope of the project was to install digital signage solutions, fit-out student meeting and collaboration rooms, staff meeting rooms and a multi-media room. The project required these installations to occur throughout the existing four-storey building. The audio visual system was designed by Simon Alder from Alder Consulting. 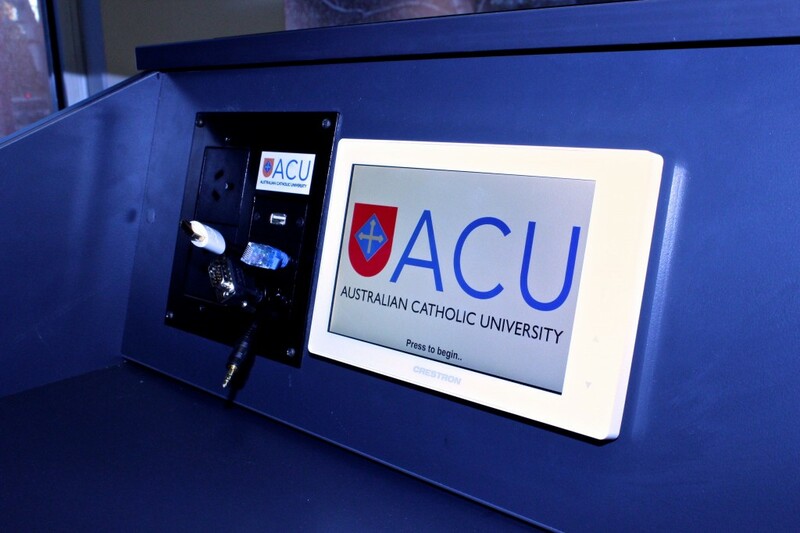 Working closely with Simon, InSight Systems were able to install an audio visual system that met all of the project requirements and will greatly assist in the learning capacity of students at ACU. The student meeting rooms and collaboration rooms used auto-sensing inputs with automated controls. By utilising these automated technologies it eliminated the requirement for training users and allows students to efficiently and intuitively utilise the spaces with inputs from any device. The multi-media room features a touch table and a massive 240” projection. Using two projectors and dual projection image blending InSight Systems were able to create a massive, bright and clear image; allowing the presentation of highly detailed documents. While the touch table allows a number of students and teachers to share information and work collaboratively. Digital signage throughout the building is controlled by a Brightsign system. This system allows the librarians to update and display relevant information to students quickly and easily, ensuring that the library is fully and efficiently utilised. By using high quality components from Mitsubishi, Epson, EAW and Crestron Digital Media throughout the installation InSight Systems have ensured that the library meets all of the project requirements and will continue to function optimally for years to come. To find out more about how InSight Systems can help with your installation call 1300 369451 to speak to an audio visual consultant.